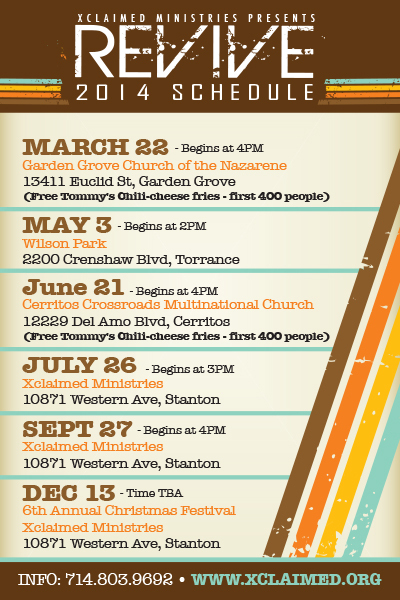 Xclaimed Ministries is heading to Garden Grove, California for our first outreach event of the 2014 season. It is a great privilege to be hosted by Pastor Dan Keeton and the Garden Grove Church of the Nazarene for an exciting day of evangelism, worship, fellowship, and outreach. This is an indoor event and will begin at 4:00pm on Saturday, March 22. We will be giving away scooters and other toys to children up to 15 years old. There will also be a drawing for 10 bicycles (children ages 5-14 can register to win). Arrive early, registration will begin by 3:30pm. We are going back to our old habits. We have rented the Original Tommy's "Shack on Wheels" for this event. The first 400 people will receive free chili-cheese fries! This was always a big hit, especially for the youth. This is a great opportunity for churches to join together in outreach and evangelism. Bring your unsaved friends for a free concert and hear a message of Hope through Jesus Christ. We are sending the message of Jesus Christ around the world via the Internet. Over the past month, we have been focusing on our YouTube Channel. Our videos have now reached over 31,000 people in hundreds of countries and is growing at nearly 800+ views each day. This is a new ministry for us and it is exciting to see God direct us into different ways of evangelism. Keep up to date with our outreach, visit our website www.xclaimed.org, facebook and watch us LIVE on YouTube.com Saturdays at 6:00 pm and for all of our outreach events. At Xclaimed Ministries, we are dedicated to consistently being an active outreach to people in need and by doing so, we are very often blessed to see lives changing physically and spiritually. 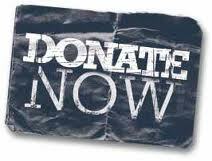 If you would like to help financially, let God lead you to your tax-deductible gift. Please make checks payable to Xclaimed Ministries or donate online (electronic check or credit card) at our secure online donation page .